Summer is right around the corner so that means some new hairstyle inspiration was in order. I love Summer because it means trips to the lake, camping, boating, barbecues, roasting marshmallows, sugar and spice and everything nice. Summer is the best time to whip out your best braids and live a little more carefree. I plan on doing another heat-free summer this year where I pack away the curling iron and straightener and embrace my natural texture. I won’t lie, it’s super hard to do but I have a feeling it’ll be a little easier than last year. But enough of that, on to the tutorial! Step 1 / With a deep side part on the left side, take a section of hair, on the heavy side of the part, and divide it into three pieces. Step 3 / Next, cross the back under the middle strand. Step 4 / Cross the front strand under the middle, take a section of hair directly below it and add it in as well. Step 5 / Then, take the back strand, cross it under the middle, and bring in a section of hair, adding it in with the strand. Step 6 / Simply repeat steps 4 and 5 until the braid reaches the top of the ear. Then continue braiding a regular braid to the end of the hair and tie it off with a clear elastic band. Step 7 / Repeat steps 1-2 on the other side of the head. Step 8 / Wrap both braids to the back of the head and tie them together with a clear elastic band. Then remove the original bands from each braid and smooth out the strands. Step 1 / With a part on the right side, create a dutch braid on the left side, and only bring in hair until it reaches the left ear. Step 2 / Braid the rest of the section down into a regular braid tying off the end with an elastic band. 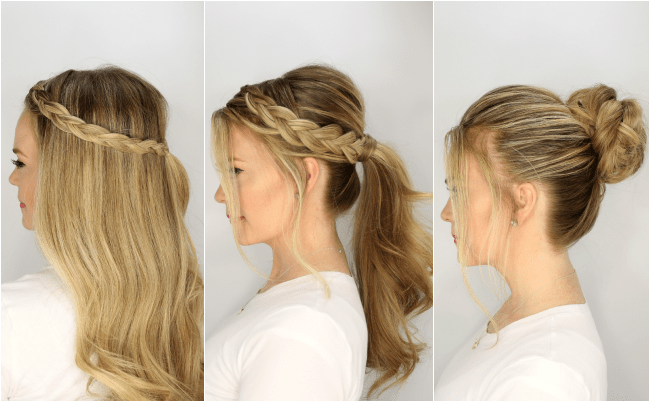 Step 3 / Pick up a small 1″ section of hair on the right side of the part and braid this section into a regular braid, tying off the end with another clear elastic band. Step 4 / Brush all the hair up into a ponytail. Leave out the braids for now. Step 5 / Once all the hair is positioned for the ponytail, bring the braids in so they lay on top of the hair. This is important so they don’t get buried by other hair when creating the ponytail. Step 6 / Wrap all the hair together into a ponytail with a hair band. Step 7 / Pick up a small piece of hair from under the ponytail, wrap it around the band, and secure it with a bobby pin. Step 8 / Gently loosen hair at the top of the head to create a hint of volume. Step 1 / Brush all the hair into a high ponytail and secure it with a hair band. Step 2 / Divide the ponytail into two halves. Step 3 / Take one half and divide it into two more halves. Step 4 / Create a fishtail braid crossing small sections underneath and adding them into the opposite side. Alternate the strands braiding down the section and tie it off with an elastic band. Step 5 / Repeat steps 3 and 4 with the other half of the ponytail creating a second fishtail braid. Step 6 / Take one braid and wrap it around the base of the ponytail. Pin it down with hair pins. Step 7 / Wrap the second braid around the first, pinning it down as well. Step 8 / Spray the style with hairspray and smooth down any flyaways. Step 9 / Create volume at the crown by gently loosening the hair at the top of the head. Love style #2 — just wondering if you are using freshly washed/dried hair or day-old hair? Also do you straighten your hair first?